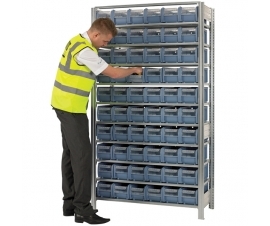 Kanban shelving is a shelving bay system with sloped shelves for easy and regular picking access from containers. Kanban shelving is also the right height for most operatives. 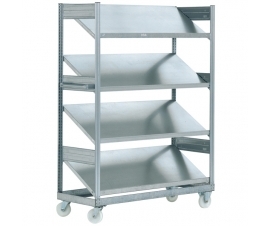 Sloped shelving can simplify stock rotation and replenishment. 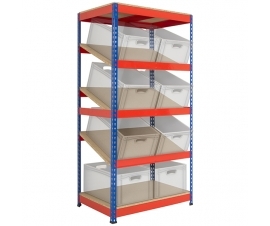 Kanban shelving is a sloping system of shelves for easy and regular picking access from containers. Kanban shelving is also the right height for most operatives. 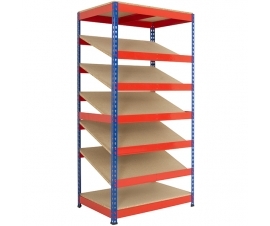 Sloping shelving is a simple stock rotation and replenishment solution. It is also commonly found within production lines for increased efficiency during manufacturing operations. In some setups: When the front container is removed the bin behind takes it place. We can provide you with the right containers for your shelving bay/setup and if you are unsure please contact us for advice and we will be able to help you.